Some people like it hot. They enjoy the challenge of consuming the hottest peppers in the world. Some enjoy a good discussion over a good spicy meal start by saying “Do you know the name of the hottest peppers in the world?” In any case, I think it’s fun to know the names of hottest chili peppers in the world. Who knows maybe even dare to try them! First you need to know about SHU numbers. The Scoville scale measures the amount of heat found in a chili pepper. The units of measurement from this scale are referred to as SHU. What the Scoville scale is actually measuring is how much capsaicin (the compound that causes the burning sensation when it comes in contact with skin) is in a particular pepper. The peppers with the highest SHU scores are determined to be the hottest in the world. 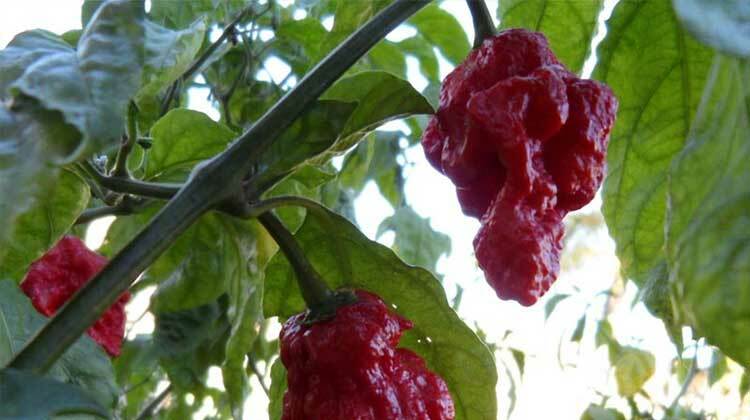 The Trinidad Scorpion pepper got its name because of its thin tail resembling a scorpion’s tail. It was created by a man named Butch Taylor, who first cultivated the plant. 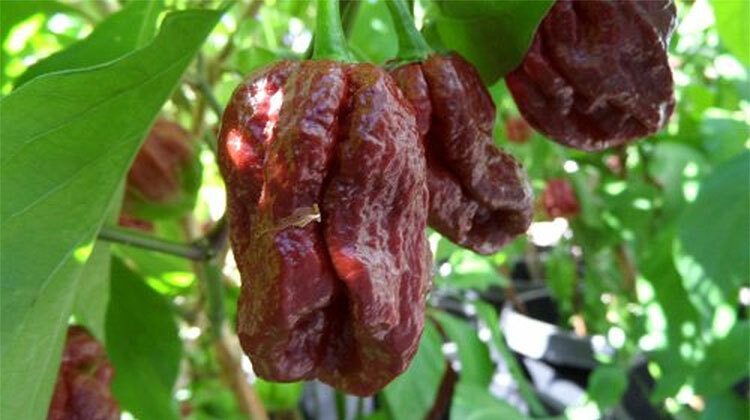 The Trinidad Scorpion Butch T pepper held the world’s hottest pepper record for a while, but it lost its title in 2012. It currently comes in fifth at around 1,463,700 SHU. 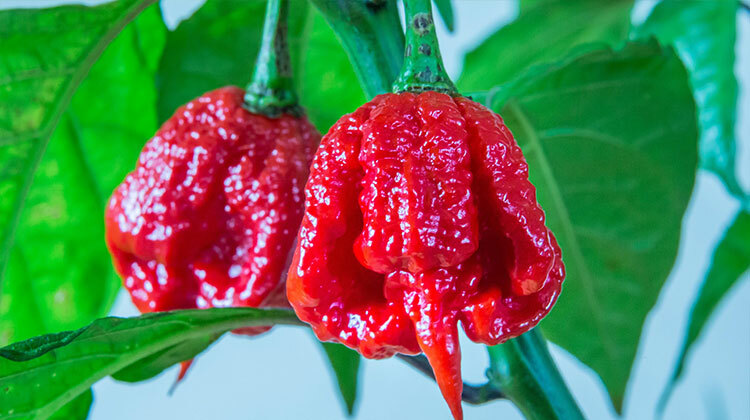 Created by Troy Primeaux, the 7 Pot Primo is a cross between the Naga Morich and the Trinidad 7 Pot peppers. Given that this pepper was born in part from the third hottest pepper in the world, it should be no surprise that it currently comes in fourth, with 1,473,480 SHU. Since its first conception, this pepper has been grown for nearly ten generations and is now considered a stable pepper variety. The 7 Pot Doughlah contains 1,853,936 SHU. It is often used to make stews and chili in Trinidad, which is where it gets its name. 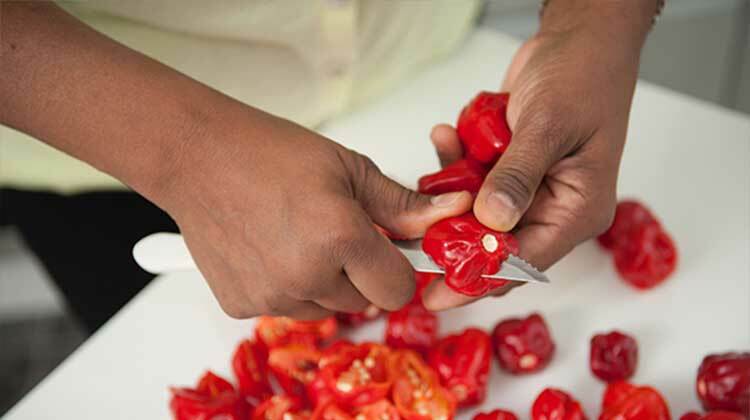 Those from Trinidad off Venezuela’s coast in the southern Caribbean claim that just one pod of this spicy pepper will make seven full pots of stew. But this pepper is also said to be one of the rarest peppers in the world. 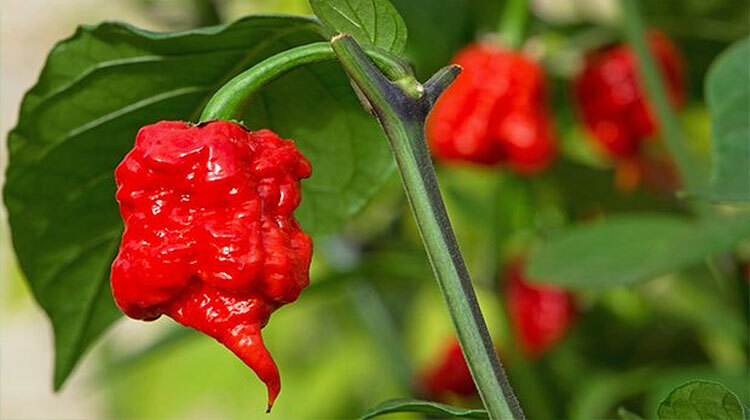 The Trinidad Moruga Scorpion pepper contains 2,000,000 SHU and was recognized briefly as the world’s hottest pepper. However, it was not officially recognized by the Guinness Book of World Records as the hottest pepper in the world. Instead, it was tested by the New Mexico State University and given that title by the university in 2012. Reaper indeed! Looks very similar to Trinidad Moruga Scorpion but looks can be deceiving. With 2,200,000 SHU, this little devil currently holds the record for being the world’s hottest pepper. 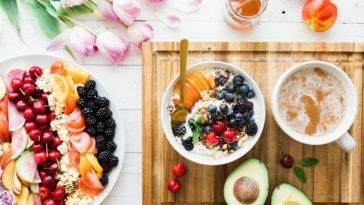 It entered the Guinness Book of World Records in August of 2013, but there could at any time be another pepper that comes along topping that record. Growers are continually trying to develop newer, hotter breeds of pepper plants. When tasting these peppers and keeping track of their spiciness, remember that the Scoville test results cannot represent an accurate amount of SHU for every identical plant. The test only records the amount of SHU on the piece of tested plant. Some peppers on the same plant may be slightly hotter or less hot than the tested pepper. In addition, the region in which the plant is grown may affect how hot or mild it is. Nonetheless, these are five of the hottest peppers in the world. Be sure you like it insane hot when you bite into one of these monsters. 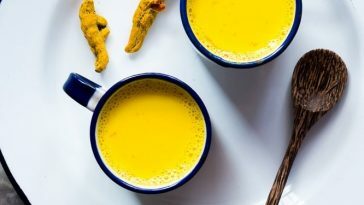 I personally don’t dare to taste any of them but LOVE to have them as a trophy in my kitchen. I think a good hot chili sauce made from variety of chili peppers that add taste to food is more fun to try and recently tasted one of the best Brazilian home-made chili sauce from The Crowes. If you live in UK and like spicy food, you will love these chili sauces.